You all know the classic shoulder poke joke, when you tap someone’s opposite shoulder and act as if it wasn’t you. Well, Volkswagen Spain used this joke to promote the efficiency of their Side Assist cars feature. The Side Assist feature consist of a flash light on the car’s side mirrors that blinks when you want to change lanes and detects another vehicle in what is called the “blind spot” (The area of the road not visible in the side mirrors and that causes many accidents). 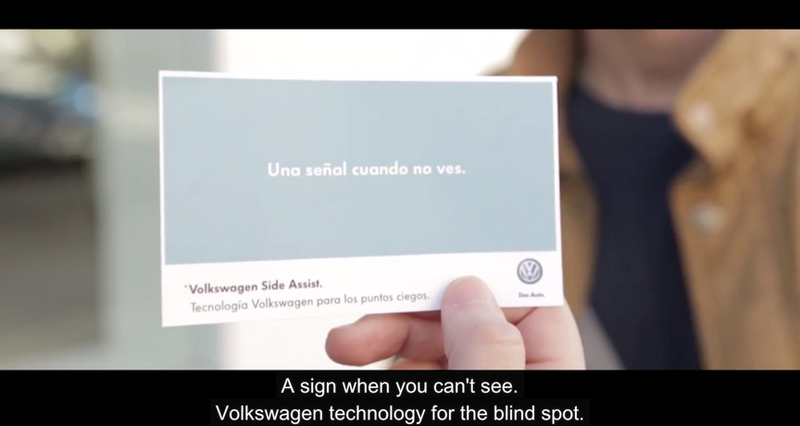 DDB Spain had a simple, yet very creative, campaign idea to raise awareness about the importance of this Side Assist feature: Pedestrians walking in front of one of the spanish VW showrooms were victim of the famous shoulder poke joke then offered a card explaining the Side Assist technology with a short sentence (in Spanish): “A sign when you can’t see.” The efficiency of this campaign comes first on the offline level as the “victims” got to understand the technology through a simplified example and second on the online level as the video VW published online has an important “virality” potential for being simple, creative and funny.